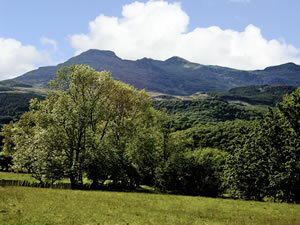 25 Tyn y Maes in North Wales a perfect base for your holiday in Gwynedd. Find out more about 25 Tyn y Maes below. This mid terrace, 19th Century cottage is in the village of Llan Ffestiniog in the Snowdonia National Park and can sleep five people in three bedrooms. 25 Tyn y Maes is a stone-built, mid terrace, 19th century cottage on the edge of the village of Llan Ffestiniog close to the centre of the Snowdonia National Park in North Wales. With three bedrooms consisting of one double, one single and one single with extra pull out bed as well as a family shower room, this cottage can sleep up to five people. The rest of the accommodation includes a fitted kitchen and a sitting room with a dining area and a gas fire. To the outside of the cottage is off road parking for one small to medium size car plus roadside parking in front of the cottage, a shed for bike storage and a gravel sitting area to the rear with garden furniture. With stunning beaches nearby and the whole of Snowdonia to discover, 25 Tyn y Maes is bound to have something for everyone. 25 Tyn y Maes is family friendly self catering. We have the following details listed regarding 25 Tyn y Maes accommodation accessibility but we would recommend that you always confirm these prior to booking with the owner or operator. 25 Tyn y Maes is a great base to explore the wonders of Gwynedd and you will find plenty of activities near by. 25 Tyn y Maes is at Llan Ffestiniog, Gwynedd LL41 4NW. Check out the map below for directions, use the controls to zoom in. If you have stayed at 25 Tyn y Maes why not add your thoughts, comments, pictures to our Facebook page? Don't forget to add the name/town/page link to your comment so its attributed to the correct place. Please keep it polite, we are sensitive souls! Find Cottage Holidays works closely with independent cottage owners and leading holiday travel operators to provide you the widest choice of self catering accommodation across Wales. 25 Tyn y Maes in Gwynedd is available through: Sykes Cottages. Stayed at 25 Tyn y Maes?